Rainbow - Tiger Tim's Own! Well, it's been a week since my last post and since then I've gone through my entire comic collection to re-count them! I have 1,267 of them (Not including annuals)! I know it's not the biggest collection in the world, but I'm still proud of every one of them! So, as I looked through them I thought long and hard about what I should write a post upon next. In the end I decided upon these two classic Rainbow comics, both from 1945! These 8 page comics (although some parts wouldn't be accepted today) are funny and a great pass-time! I can just imagine a little boy or girl sitting in front of the fire on a cold winters night, enjoying the mixture of text stories and strips! So, what were some of the characters in Rainbow? Tiger Tim (and chums) would probably be the most recognised as he was on the front cover and there were many annuals plus Tiger Tim's Weekly! 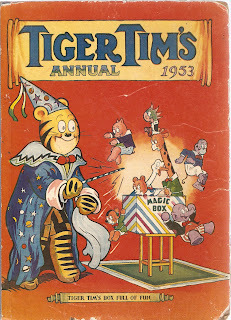 I think, but I'm not sure, that Tiger Tim was drawn by Bert Wymer. Can anybody back me up on that? Also on the front cover is Policeman Pete, who is always overcoming small but challenging problems! Mrs Tabby and her Tibbies, is where Mrs Tabby puts a stop to the Tibbies menacing! Bonnie Bluebell - a children's Sherlock Holmes (it's a bit corny though), Sing Hi and Sing Lo - two Japanese who get up to some small but everyday adventures. The Two Pickles who have a cheeky dog called Fluff. 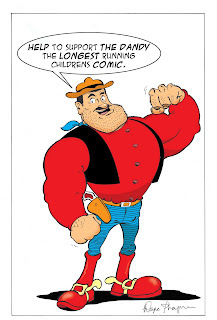 He is a really enjoyable character and I'm sure many children would have laughed with him over the years! Ken the Pilot Boy, Pride of the Ranch, Sonny Day, Our Jolly Dolli-Wogs, The Merry Mice, Marzipan the Magician, On Holiday Farm, Tommy and His Trains and many more all filled up the pages of this cheery wartime comic! I think all the characters are fun and enjoyable and just wish there were still comics like this one around today! Ever since the revamp of The Dandy back in October last year many nasty comments from bored and mindless critics all over the world have been popping up on this thing we call the internet. I'm not here to rewrite what Desapeate Dan artist Jamie Smart wrote here - http://www.fumboo.com/blog/an-open-letter-to-the-internet/comment-page-1/#comment-5826 and here: http://www.fumboo.com/blog/criticisms/, or what Lew Stringer, artist of Postman Prat, wrote here: http://lewstringer.blogspot.com/2011/09/days-of-thrills-and-laughter.html, but it'll probably end up as pretty much the same message. 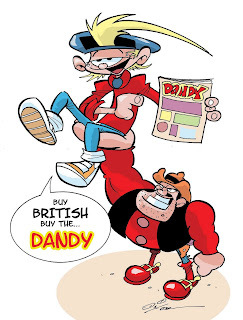 As we all know the Dandy sales have dropped dramatically since last year, but personally (and I know I'm not alone here)I'm fed up of hearing: "...The Dandy will fold..." or "..It will merge with The Beano..." etc. because there is currently no evidence towards this and before that happens D.C. Thomson will probably do their best to save the much loved title anyway. But what they did was a very brave and bold move - removing all the free gifts, having 100% comic strips and making it come out weekly! Surely they deserve something for that? 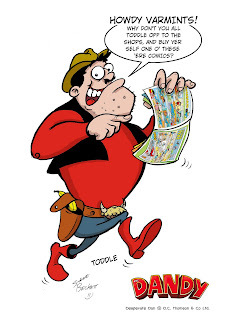 Oh, and Desperate Dan did NOT start being drawn by Jamie Smart at the revamp as many state - it happened four years ago! If readers hadn't liked it I doubt Thomson would have kept good ol' Jamie for that long! No, comics aren't like they were back in the 1960's, but these days they have to make themselves heard above the charm of iPods and video game explosions! Just walk into your local Tesco's today and if your lucky you'll probably find The Beano or The Dandy hidden somewhere behind a hoard of girls and baby comics. Visibility is another problem! It is often very hard to find comics in shops with crammed shelves (I've read that many WHSmith stores rarely have The Dandy and Beano). There was a useless author in a recent Sunday Times who made up facts and stole artists comments from their websites. Surely newspapers should be helping to support Britain's comics - not making up nasty comments. I'm going to stop moaning now, it wont help anything! 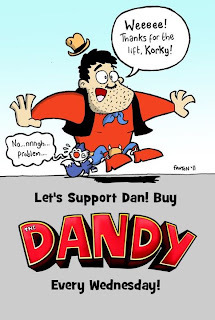 Over on The Dandy facebook page some artists and fans have been posting "Save The Dandy!" posters. I thought they were quite nice, so I've downloaded them to share with you here! Keep it up guys! I'm loving these an I hope you post many more! 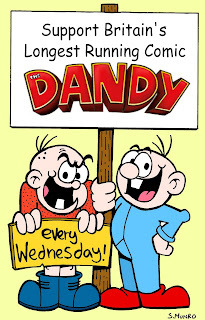 So, help the Dandy (and the Beano) by buying a copy (or two) every Wednesday, reccommending to your friends and family and sharing your copies around to get others intrigued! Cheers! Update! Madvertisements back on track? I said in my previous post that madvertisements are now becoming a waste of space. 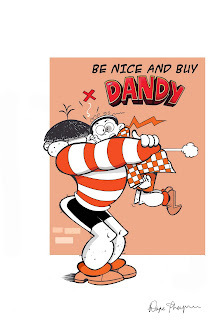 Well - the latest Dandy has proved me wrong! 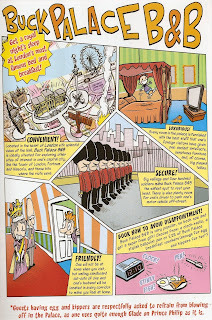 This weeks madvertisement was drawn by the amazing Nigel Auchterlounie (artist of Jibber and Steve and The Bogies) for Buck Palace B&B! There are five wonderfully drawn boxes with lots of words in each one! This is defiantly my favorite Madvertisement that has been in the Dandy for quite a while and I hope that they stay like this! 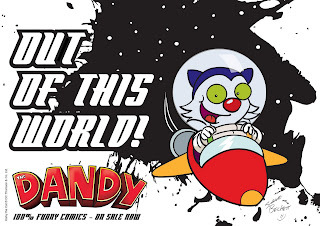 So pick up a Dandy now and have a laugh! 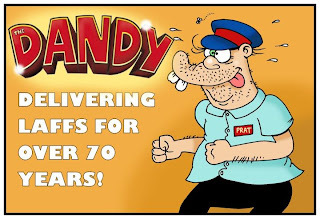 Dandy 17th September 2011 - £1.50! Madvertisments - a wate of space? The oldest Madvertisement from a comic I've got is one Oink comic (#7 - 26th July - 8th August 1896). There were fake advertisements before this, but this is the earliest I could find actually titled 'MADVERTISEMENT'). 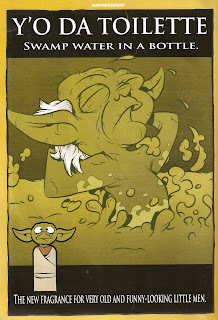 Oink had many fake advertisements through it's time, and they were brilliant with good artwork and were actually funny! Here is an example from the 1988 Oink book. 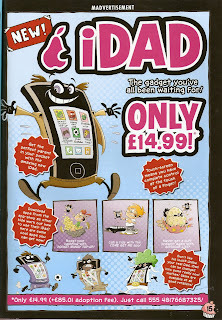 When D.C Thomson relaunched The Dandy almost a year ago they also included a full page Madvertisement. Here are two of them, one from #3508 (top) and one from #3549 (bottom).